Minister of State, Joseph Harmon (Center) with Permanent Secretary of the Ministry of the Presidency, Omar Sharif at right. Minister of State, Mr. Joseph Harmon, has reiterated that the reason Permanent Secretary of the Ministry of Presidency, Mr. Omar Shariff was sent on leave, was to facilitate the ongoing police investigation into the acquisition of his personal assets and accounts. “The fact that Mr. Shariff has been sent on leave is because of an investigation by the SOCU [Special Organised Crime Unit] and he was sent on leave after he advised me that he was being investigated and that the Police ranks from the SOCU were at his office and that they were taking him down for an investigation into what he said to me were matters of a private nature and involving tax liabilities. So it would not have been proper practice for him to remain on the job while he was being the subject of such an important investigation.” Harmon was quoted as saying in statement issued by the Ministry of the Presidency. 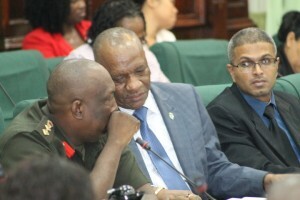 Responding directly to a statement attributed to an unnamed source in the August 2, 2016 edition of the Stabroek News, which stated, “Permanent Secretary of the Ministry of the Presidency Omar Shariff, who is now the subject of a financial crimes probe, believes he was sent on leave as a smokescreen because he had begun unearthing massive corruption, including the alleged misuse of international donor funds”, Minister Harmon said no such report or discovery was brought to his attention by the Permanent Secretary at any time. Even if this was the case, the Minister said, it is the duty of the chief accounting officer of the Ministry, to make a police report. “I can categorically state that Mr. Shariff never reported to me any matter involving any sums of money that were the subject of a fraud investigation. In any event, if that were so, then it is his responsibility, even if he had informed me, it is his responsibility as the accounting officer of the Ministry, to report that matter to the police,” the Minister of State said. Minister Harmon noted that even though Mr. Shariff was an executive of the People’s Progressive Party (PPP), the current Parliamentary Opposition, when the new administration took office, he was given the opportunity to continue to serve in his professional capacity. He received, Minister Harmon said, the benefit of the doubt from the administration. “When we took office, it was clear that Mr. Shariff had been a member of the PYO [Progressive Youth Organisation]. He was a very senior person in the PPP and in spite of all of that, when we took office, we said that we were going to rely on his professionalism to conduct what he had to do. There was clearly an opportunity at that time for him to make a separation between his service to his party and service to the Government. We gave Mr. Shariff the benefit of the doubt and requested that he remain professional in the work that he was doing,” he said. Minister Harmon refused to comment on the recent revelations in the media citing the fact that the investigation is still active. However, he said that the exorbitant accumulation of property and wealth, which cannot be justified by income, by any public servant, regardless of their position in the administration, would raise questions. Meanwhile, Mr. Shariff will remain on leave, as the investigation continues.